The team at Nyeri Hospice in central Kenya have been working hard on bringing day care services to people with life-limiting illness. Nyeri’s Day Care service, supported by Hospice Care Kenya, brings together people of diverse ages and needs, but all with experience of living with life-limiting illness. The group sessions provide peer support as well as advice from experts on important topics such as healthy eating for cancer patients, counselling to teach coping mechanisms and relaxation techniques, and legal advice on patients’ rights and help with writing a will to provide for loved ones in the future. Over the last 6 months Nyeri Hospice has helped over 1,000 patients with day care. 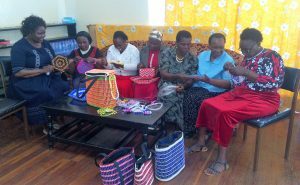 (Photo shows cancer survivors learning bead work during an occupational therapy day care session).